Much of Bell Sound is quiet shallow. The large and sheltered Bell Sound offers an amazing range of blues, greens and turquoise hues. Partially enclosed by the central land mass and extended northern peninsula of South Caicos, Bell Sound is a shallow lagoon with brilliant turquoise water. The majority of this lagoon is a protected area, namely the Bell Sound Nature Reserve. The nature reserve covers an area of 4.4 square miles, but the name Bell Sound is often used to refer to a greater area that continues on to the small cays found between South Caicos and East Caicos. Although much of the Bell Sound coastline on South Caicos is either rocky or a bit swampy with mangroves, several small sandy beaches can be found. These spots are excellent for launching kayaks and paddleboards, but aren’t really great for swimming as the water is very shallow and the sand is quite silty. Bell Sound is quite scenic. Excellent views can be had at many sites, but the high ground at Plandon Cay Cut Beach and at the abandoned US Coast Guard LORAN Station offers the best view. On a sunny day, the varying colours of the channels, waterways and shallows is breath taking. The greater Bell Sound region and the small cays between South Caicos and East Caicos is probably the finest serious paddling location in the Turks and Caicos. 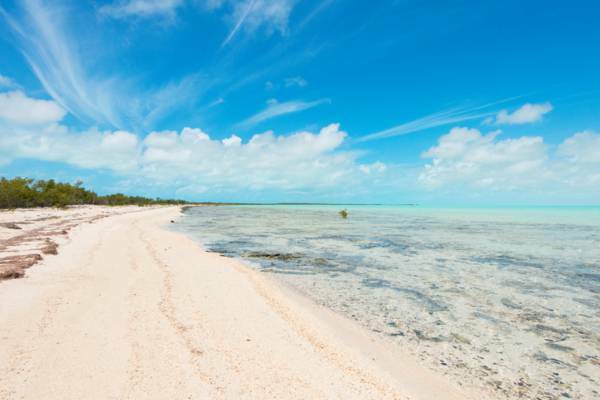 A string of small uninhabited islands, including Sail Rock Island, Plandon Cay, Middle Creek Cay, McCartney Cay, and Hog Cay, offers spectacular channels, sand banks, mangrove wetlands and coastal scenery. Due to the limited tourism industry on South Caicos, we recommend planning such an adventure in advance. Big Blue Collective is the foremost water sports operator on the island. It’s illegal to fish in the confines of the Bell Sound Nature Reserve, however, the shallows outside of the protected area provide world-class flats fishing. Bonefish, tarpon and barracuda abound.